The Moolmanshoek Valley surrounds you by majestic mountains. A beautiful wedding venue. 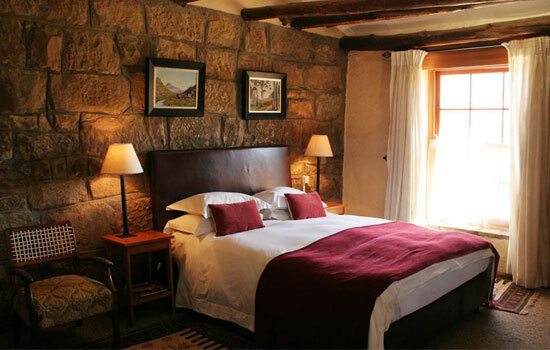 Our sandstone lodge provides accommodation options, to suit every travellers needs. A happy place of endless fields of grass and mountain streams, tumbling down. Herds of game roaring on the plains. Springbuck, Blesbuck, Blackwilde beest , Oryx, Eland and Zebra, to name a few. The Reserve was declared a Natural Heritage Site because of the indigenous Bamboo which grows in the area. Experience the view from Visierskerf(2407m), Sekonjella’s hoed or the Pyramid. Explore the Reserve through our different activities including horse riding, hiking, game drives, horse cart rides, fishing, 4×4 trails, mountain biking and bird watching. For the children, running wild and free, abundant open spaces. A piece of paradise. 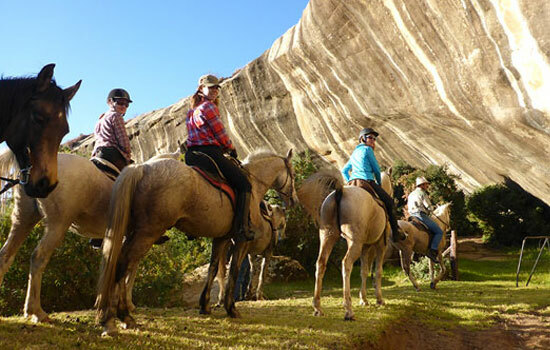 Explore this unique setting on horseback or relax while watching big herds of animals on a game drive while sipping a sundowner. Enjoy hiking, fishing, 4×4 eco trails, Mountain biking and bird watching. Book a picnic in the field to unwind your mind. 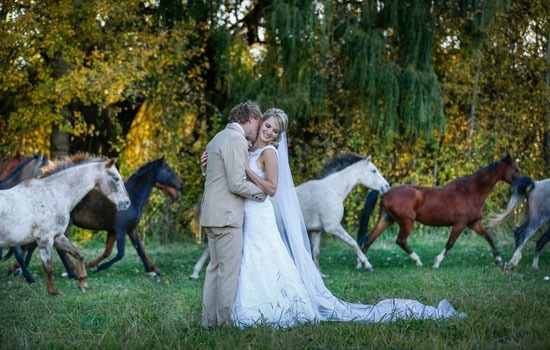 Moolmanshoek, with its uniqueness of its surroundings, offers you a spectacular wedding celebration venue. Moolmanshoek’s conference facility is the perfect place to sharpen your saw. Whether for team building or planning ahead for the new year. Come and invest in your marriage. Join us for a special Romance weekend where you and your spouse get to spend quality time together by enjoying a picnic lunch at one of our picnic spots as well as a double message booked for the couple. We will also be serving a 5 course meal in celebration of the couples life together. I am not one to give a rating often, but Moolmanshoek is absolutely spectacular. Great views, hiking, biking, horse riding for beginners as well as advanced riders, mountains, game viewing safaris, picnics, great accommodation and of course great service and friendly faces. Can’t wait to go back! I definitely recommend Moolmanshoek Private Game Reserve for families, couples, friends or just a weekend breakaway! Moolmanshoek is a definite bucket list item, which I have recently had the privilege to mark as visited. Tranquility that makes your ears ring. Breathtaking nature, wild horses, majestic mountains, scenic routes varying from hiking, cycling, horseback, game drives and 4x4 trails. To top the experience, the reception, guides and personnel are professional, friendly, so helpful and fully trained and experienced in all activities hosted on the Reserve. Moolmanshoek is an incredible experience to have as well as relaxing to the soul. Thank you guys for friendly service and amazing hospitality! Just wanted to say thank you to Wiesman, you and the whole team (including please Oom Romeo) for the fantastic Lesotho ride last week. I am sadly sitting behind a desk looking at a wall….not looking at some incredible vista. It is most depressing. The trip was so well organized from start to finish, cannot compliment you more on how friendly and organized and generous everyone was along the way. Your staff were excellent and Wiesman a true inspiration in so many ways – I am sorry I called him a cowboy (!) I had no idea who I was dealing with! Most embarrassed. Also hats off to Sampie, Cliff, Alphonsina, Pella, NC and Marianne, nothing was too much trouble and the camaraderie and support we had was truly special. Of course the horses were completely awesome. I hope they are deep in a field of grass on your beautiful farm. I will remember that week for the rest of my life, it has had a huge impact on me personally – I really feel like I conquered my own mountains! Also getting back to those pristine, comfortable rooms at Moolmanshoek and being offered a lovely glass of wine (after a hot shower and change) was the BEST! THANK YOU ALL SO MUCH. TRULY, TRULY A REMARKABLE EXPERIENCE.